British Prime Minister Theresa May has backed a United States call for a de-escalation of hostilities in Yemen. "We certainly ... back the U.S.'s call for de-escalation in Yemen," Mrs May told parliament. "A nationwide ceasefire will only have an effect on the ground if it is underpinned by a political deal between the conflict parties." It comes after US Secretary of State Mike Pompeo yesterday said UN-led negotiations to end the conflict in Yemen should begin next month. In a statement, Mr Pompeo said missile and drone strikes by Iran-allied Houthi rebels against Saudi Arabia and the United Arab Emirates should stop, and the Saudi-led coalition must cease air strikes in all populated areas of Yemen. 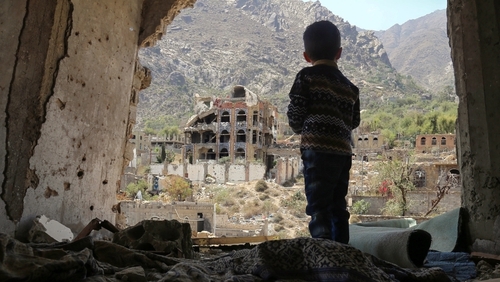 Yemen is one of the poorest Arab countries and faces the world's worst humanitarian crisis, exacerbated by a nearly four-year-old war that pits the Houthis against the internationally recognised government backed by Saudi Arabia, the UAE and the West. "The time is now for the cessation of hostilities, including missile and UAV strikes from Houthi-controlled areas into the Kingdom of Saudi Arabia and the United Arab Emirates," Mr Pompeo said, using an acronym for unmanned aerial vehicles. "Subsequently, coalition air strikes must cease in all populated areas in Yemen," he added. US Secretary of Defense Jim Mattis said he believes Saudi Arabia and the UAE, who are in a US-backed coalition fighting Shia Houthi rebels, are ready for talks. "We have got to move toward a peace effort here, and we can't say we are going to do it some time in the future," Mr Mattis said at the US Institute of Peace in Washington. "We need to be doing this in the next 30 days." He said the US is calling for all warring parties to meet with United Nations special envoy Martin Griffiths in Sweden in November and "come to a solution". Saudi Arabia and its allies intervened in the conflict between embattled Yemeni President Abedrabbo Mansour Hadi, whose government is recognised by the United Nations, and the Houthis in 2015. Three-quarters of Yemen's population - 22 million people - require aid and 8.4m people are on the brink of starvation. The United States has faced fierce international criticism for its role in supporting the Saudi-led coalition, especially after a series of strikes killed scores of civilians. Mr Mattis said US support is based primarily on teaching the Saudi air force to improve targeting and to not drop bombs when there is any doubt about what they might hit. "Our goal right now is to achieve a level of capability by those forces fighting against the Houthis that they are not killing innocent people," he said. "The longer term solution, and by longer term I mean 30 days from now, we want to see everybody around a peace table based on a ceasefire, based on a pull back (of Houthis) from the border and then based on a ceasing dropping of bombs that will permit the special envoy Martin Griffiths ... to get them together in Sweden and end this war. That is the only way we are going to really solve this." Last month, UN-led peace talks failed to take off after Houthi rebels refused to fly to Geneva over what they said was the UN's failure to guarantee a safe return to the capital Sanaa, which the group has controlled since 2014.